Priest River, ID – Lone Wolf Distributors is pleased to announce the latest expansion of our AlphaWolf barrel line. 9x18 Makarov conversion barrels for the Ruger LC380, will mark our first offering for the Ruger family of pistols. With the bargain price of 9x18 Makarov ammunition, and the bump in performance over .380ACP, now you can maximize the potential of your Ruger LC380! 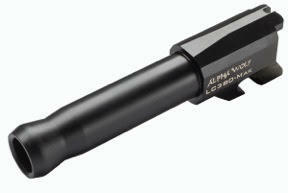 AlphaWolf barrels are PROUDLY MADE IN THE USA, for Glock, Smith and Wesson M&P Shield, Browning Hi Power and now Ruger LC380. Designed for lead, plated, or jacketed ammunition. Button rifled, three-stage honed bore and made from certified, stress relieved 416 Stainless steel. Exacting tolerances allow for a drop-in installation, and industry recognized SBN (Salt Bath Nitride) premium coating offers maximum durability and protection.